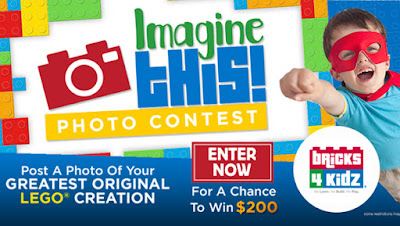 Our Perfectly Imperfect Life: Bricks 4 Kidz Imagine This Contest! Bricks 4 Kidz Imagine This Contest! Post a Photo of Your GREATEST ORIGINAL LEGO CREATION For A Chance to Win $200 And Be Featured in A NATIONAL BRICKS 4 KIDZ ADVERTISING CAMPAIGN! Want to win? Here's how...Go to https://www.facebook.com/bricks4kidzcorp/app/577559595616814/ and Submit Your Photo. Encourage friends and family to VOTE FOR YOUR PHOTO. The person with the most votes wins! This post is sponsored by U.S. Family Guide, & Bricks 3 Kidz. I will receive a free $25 giftcard from restaurants.com for making this post.